The Editor is your start-to-finish course authoring and content management tool! Course settings, which allows you to control the course's general setup, appearance, and gradebook and scoring information. The Landing page editor, which allows you to create content to appear on the course's Activities screen. Course Links, which allows you to provide students with links to important course resources. Students can access these links from the Course Links button in the Course Home (Activities tool) toolbar. Edit objectives, which allows you to Import, Add, Edit, and/or Delete objectives. 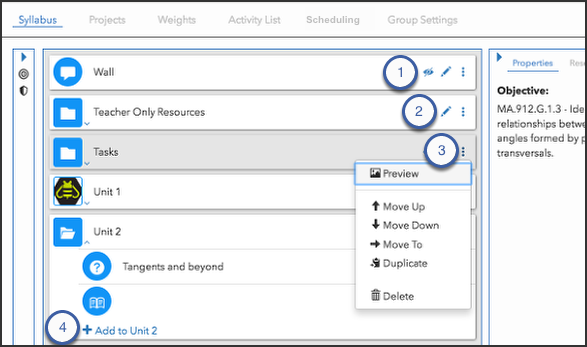 Manage Groups, which allows you to create, edit, and delete group sets. Find Activity, which allows you to search by activity title or ID. When you find the activity you're looking for, click to jump to it. In the Gradebook tab next to the Formative Assessment header: Excuse activities for students who demonstrate objective mastery. Learn more. In the Gradebook tab next to the Remediation Assessment header: Encourage students to revisit relevant activities when they fail to demonstrate objective mastery. Learn more. Use Syllabus to structure your course, author, content, and align it with objectives and badges. Use Projects to build robust, student-guided projects for project-based learning (PBL). Use Weights to define and manage grade weights for activities and categories. 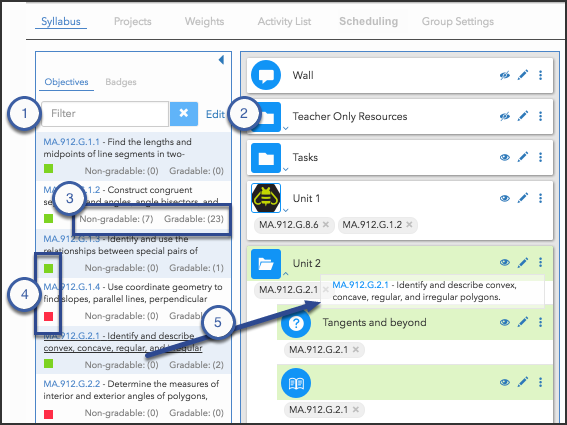 Use Activity List to review your course structure and preview activities. Use Scheduling to review your calendar, create and adjust due dates, and plan your course. Use Group Settings to manage existing groups. Review each in more detail, below. Drag and drop objectives to folders and activities to align them. 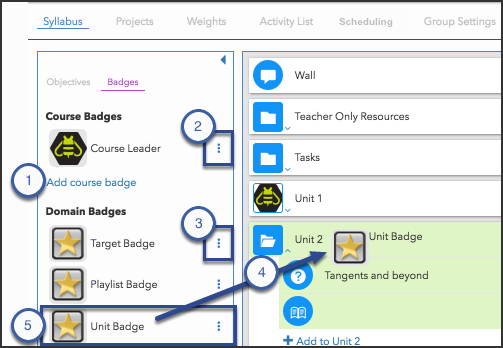 Edit, delete, or view details of existing course badges. Drag and drop badges to folders and activities to align them. Select any badge and review its properties in the Properties tab. Set student visibility settings by toggling the eye (visibility) icon. Open the side menu to Preview, reorder, Duplicate, or Delete folders and activities. You can also reorder folders and activities by clicking and dragging them to the desired location. With the Properties tab, you can select a folder or activity from the center panel, an objective from the Objectives tab, or a badge from the Badges tab and review its properties (Title, Type, metadata, visibility settings, Completion badges, Due dates, Objectives, etc). Click the photo (preview) icon to preview and the side menu to make edits. Next to the Name field in the badge editor: Use replacement variables to personalize badges. Learn more. Next to the Add to ... syllabus header: Need help deciding which activity type to choose? Learn more. Next to the Add POST parameter option in the Content section of the Activity tab; this only occurs with Website activity types: You can use replacement variables in the website URL or in POST-parameter values to pass user-, course-, or domain-specific data to external websites. Learn more. Toggle between a list and tiled view of existing projects. 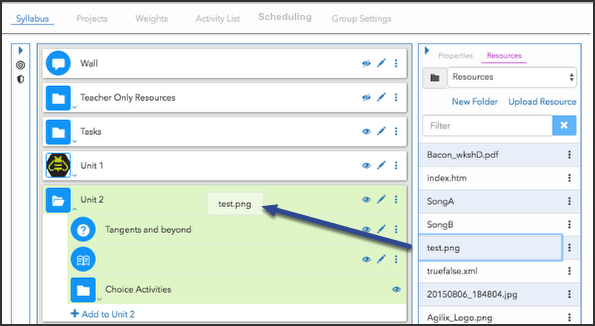 Sort displayed projects by Title, Start date, and End date by clicking the appropriate column headers. Click on displayed project data to edit it with the Properties/Resources panel. Grading Weights define how much impact that activity’s grade has on the final grade, relative to the other gradable activities in the same category and/or course. Learn more. Use Delete Selected in the toolbar. Select folders and activities to view their Properties. Use the side menu to Edit, Preview, and Delete folders and activities. 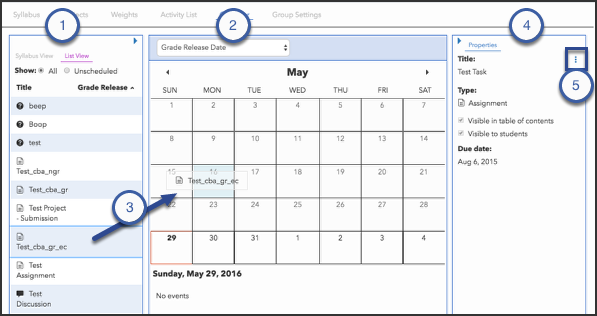 Drag and drop activities onto dates on the calendar to assign Due Date, Visibility Date, or Grade Release Date, depending on what is selected in the calendar dropdown. Use the side menus to Edit, Preview, and Delete folders and activities. Depending on which items you're showing, you can also use this menu to Remove Due Date, Remove Visibility Date, or Remove Grade-Release Date. The Group Settings tab allows you to review and modify group-specific settings. Thanks for your feedback, John. I will make sure to report them both to our team. If groups are enabled it is possible to edit the folder visibility for select groups. If you create a group just for your transfer students you can set the desired folders to not be visible for that group, which will make the items in the folder not required for members in said group. Hey Josh, "activities within choice folders" don't show up in which list or search results? Are you talking about the Activity List tab? Gideon, they are the same. If you create groups in the People tool, they will be the same groups you see in the Editor. At this time there is no way to edit this type of pre-existing HTML in Buzz, it would have to be modified using the BrainHoney editor. In the old editor, if existing text was formatted with a color and text was pasted over the existing text, the style was automatically applied. In the new editor, pasted text reverts to default styling. Is this expected behavior or a bug? The process for duplicating an activity seems a bit clunky compared to the old editor. It would seem to me that the copy function would be used far more than the visibility option and thus a copy / paste function could be put in the shortcut area instead of (or along with) the visibility. Is there a way to edit HTML in the new editor? Some of my old editable contents have borders throughout the content, but I'm not sure how to change or erase them in the new editor. Yes that's right. They don't show up in the Activity List tab. Currently, this has to still be done in BrainHoney to have it appear in Buzz. I notice that activities within choice folders don't show up in this list and they don't appear in search results either. Am I missing a setting? Quick question: There no longer seems to be an option to import a Common Cartridge? Josh, I just visited with my team about this and they said that it is currently not displayed in the Activity List because of how these activities are stored. They are not stored in the same fashion as the other types of activities, but is something that could be investigated and, possibly, enhanced. I would recommend posting this suggestion over in the Buzz: Product Feedback page. Thanks for letting me know that I wasn't missing something. I'll head over to the feedback page as you recommended. Can Modules be removed in class groups instead of just excluding assignments? For example, with students just participating in second semester of the course can the first semester modules be removed from view without editing the master course? I've been playing a bit with the new editor and have a question regarding the group function. Are the groups that are created within the People section applied to the group sets that are in the Editor, or are they separate?